Comedian/rapper Donald Glover (aka Childish Gambino) has created a rich, hypnotically dreamlike half-hour comedic television drama about the African-American male experience navigating the fringes of the music industry set and filmed in his titular hometown of Atlanta. The FX series effortlessly explores artistic pursuits imaginatively with a stylish malaise and charming hangout vibe in the vein of Girls with a Louie auteurist bent. "Two cousins work through the Atlanta music scene in order to better their lives and the lives of their families." Glover stars as Earn, a struggling Princeton drop out, looking to hustle his way to prosperity and out of functional homelessness. Filling out the starring trio are Brian Tyree Henry as Earn's cousin Alfred, an upcoming rapper called Paper Boi, alongside a deadpan Lakeith Stanfield as his dryly hilarious and perpetually high best friend/hype man, Darius. The charismatic group, each with their own distinct personalities, voices, and motivations, spends a large of amount of their time walking the streets and waxing nostalgic. Zazie Beetz co-stars as Van, Earn's baby mama, who mildly tolerates his delinquency while reinforcing her own status as an independent woman refusing to put up with any drama. 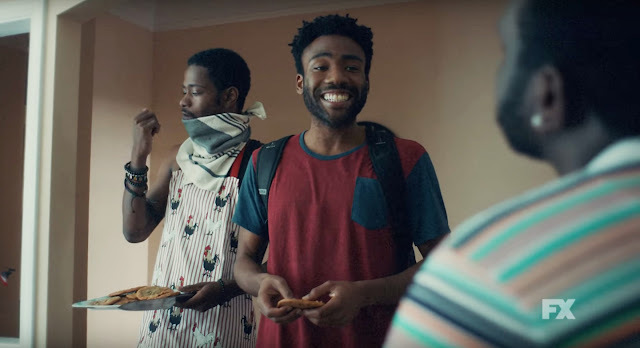 In part written by Stephen Glover, Donald's younger songwriter brother, and directed mostly by Childish Gambino regular music video director Hiro Murai, the series has a stylish, consistent look and feel while maintaining a refreshing tone and composition no doubt influenced by the novice status of most of its creative crew outside of Glover. This is Murai's first narrative feature work and the first production for nearly all of the all-black writer's room as they set and maintain the show's appealing aesthetic throughout. More than just a show documenting a rise-to-fame story (à la Entourage), it's very much about the Atlanta hip-hop subculture while never shying from the daily problems young black men face in terms of class and race. Atlanta is totally appealing and even comments on Glover's status as an entry-point for hip, young white America into black culture riffing on his friendly image and perception while cementing his credibility—not that he ever needed to. Described as "Twin Peaks with rappers" by Glover, Atlanta embraces the weird with sophisticated humour and imaginative detours in its loose but purposeful structure. The second episode takes place almost entirely in a police station and holding cell as the show deftly comments on African-American sexuality, violence, and social class. There's a purposeful surrealism that gives the show such a magical feeling sense of place. 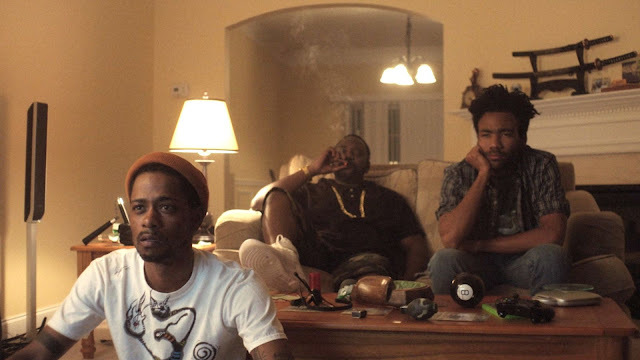 What ultimately makes Atlanta so successful and appealing as a piece of contemporary television is its exploration of young men earnestly trying to better their lives. It's both universal in spirit and completely specific to the lives of black men in the South. The show has a laid-back, slow burn narrative rich with composition in its location and setting. Clearly, both the story and city of Atlanta are a home for Glover and the show expresses that sentiment splendidly. Atlanta's first ten-episode season premieres Tuesday night on FX.